Sooner or later, every woman is faced with the appearance of first wrinkles and fine lines around the eyes. The main reason for the appearance of wrinkles on the skin is the insufficient production by the body of collagen – a special protein, durable and at the same time sufficiently flexible. It is known that collagen fibers form a skeleton of the skin. When, for various reasons the synthesis of new collagen fibers slows down, we have to look for one or another way to remove wrinkles under the eyes. Around the age of thirty years, women begin to think about how to remove under eye wrinkles and fine lines around the nose and forehead. It is at this age the amount of collagen in the skin decreases. The top layer of the skin becomes thinner because of the slowing down of the natural regeneration processes. In addition, deteriorates the ability of the skin to retain moisture, and the skin on your face becomes less supple and elastic. The skin around your eyes is thin and delicate, and it contains very few sebaceous glands which ensure timely and adequate moisturizing. Under the influence of natural causes, the skin under the eyes is constantly exposed to stretching, resulting in quite early, about 18-20 years of age, there are first wrinkles. Gradually increasing, for several years, they form around the eyes characteristic wrinkles – “crow’s feet”. In order to remove wrinkles under eyes at home, you can choose from the following list of proposed recipes for household masks the one that is right for you. These recipes masks and wraps completely harmless and their cooking does not take much of your time. Of course, you can use special creams to prevent and smooth wrinkles around the eyes, but they are not cheap, while a homemade facial mask no way inferior to the effectiveness of natural cosmetics products and does not affect your financial condition. Mix 5 ml of olive oil and 1 ml of vitamin E. Apply a small amount of the mixture to the area around the eyes where wrinkles were formed. Lightly pat fingers and leave for 5 minutes to mask completely absorbed into the skin. It can be applied every night before bed. Rub half a small potato on a fine grater and add to it a quarter teaspoon of heavy cream. Apply to wrinkles by 15 minutes and wash off in advance brewed black tea. Mix half a teaspoon of liquid honey with 0.5 teaspoons of oatmeal and 1 egg yolk. Apply an even layer under the eyes and leave about 17 minutes, then wash off with warm water. Mix 1 teaspoon of heavy cream with the same amount of crushed pulp of a ripe banana. Apply to the skin around the eyes, clapping lightly with fingertips. After 20 minutes, wash off the mixture with warm boiled water. It is noteworthy that these masks can be used as a preventive measure so that the question of the premature appearance of wrinkles will cease to bother you. Time applying the homemade facial mask to rejuvenate skin – before going to bed; perfect – after taking a relaxing bath. Apply the mask on clean skin. Make-up should be removed beforehand. Before using the masks, make a gentle massage of the skin around the eyes with fingertips. Use an only freshly prepared mask made from natural ingredients. Components of the mask should not cause allergies and irritation. Keep the mask on your face for 20 minutes. Rinse the mask with cool water and then apply to the skin around the eyes a light moisturizer. The procedure is carried out 2 times a week. Drink plenty of water so that the skin does not dehydrate. But do not drink water at night, as there may be swelling under the eyes. Always wear sunglasses. Ultraviolet very much can damage your skin. Do not expose your face to direct sunlight, it will adversely affect your health. While your skin young small tan looks quite nice. But very often tan leads to the formation of grid wrinkles on the face. Use a sunscreen. Never rub your face, washing off makeup. Carefully, using a sponge, remove the shadow and mascara. After gently pat face with a towel. Better sleep on your side or on your back on a flat pillow, this posture can save face without visible wrinkles. Perform daily self-massage, gently massaging the skin around the eyes with your fingertips. Wash your face with cold water to improve circulation. Use ice cubes for toning the skin. To prevent the formation of wrinkles, the body must produce enough collagen. That is why, include in your diet foods such as turkey meat, seaweed, fatty fish, a salad of tomatoes, carrots, cabbage and parsley and dill, which contribute to the production of collagen. 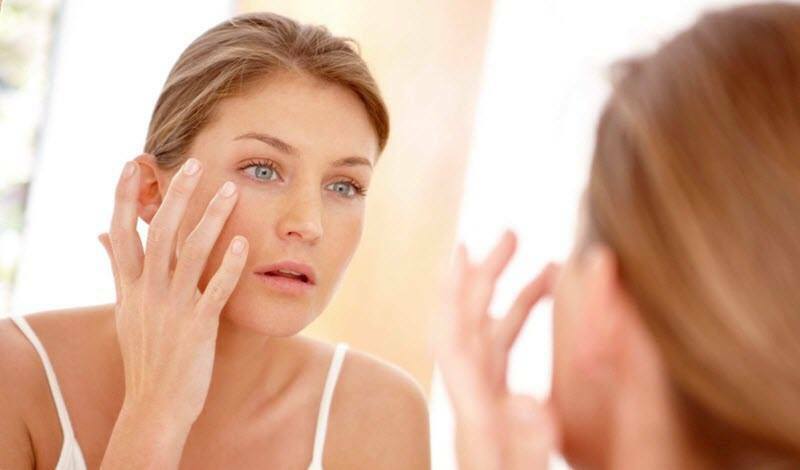 The first step in the fight against wrinkles is the hydration of the skin around your eyes. At bedtime, use freshly squeezed aloe juice to moisturize regularly. But if you are not able to use the fresh plant, you can purchase a stabilizing gel, which contains 98 percent of aloe vera juice and uses it. Natural essential oils of apricot, peach, and almond also do an excellent job with the wrinkles around the eyes. For this, it is necessary to put a bit of the oil on the skin and gently rub into the skin in a circular motion. Mix all ingredients and apply the mixture on the skin around your eyes and eyelids. Wrap the mask parchment or waxed paper and hold it for about 20 minutes. Remnants of the mask carefully remove with a soft napkin. This mask makes 3 times a week for a few hours before bedtime. The use of olive oil can also help in the fight against wrinkles around the eyes. Apply a little oil to the skin in the form of a light compress, then massage the problem areas. Cucumber has long established itself as a good remedy for wrinkles such as “crow’s feet” and puffiness under the eyes, so do not forget to apply it as well. So, you need only finely chopped cucumber, putting a couple of slices for 15 minutes on the eyes. And after that, you will feel that the skin around the eyes becomes smoother, fresher and more elastic. Over time, you will begin to notice how the wrinkles gradually leaving your face. Very effective against wrinkles is a mask made from mashed bread and a bit of warmed milk. This mask is applied for half an hour, then gently wash off with clean warm water. At home recipes against wrinkles, often use honey. Here’s one: take one tablespoon of liquid honey and one pre-beaten egg white and mix thoroughly. Apply on problem areas, wait until the mask is dry, then wash off with cold water. In fact, there is a wide selection of recipes for honey face masks suitable for different skin types that you can easily make at home. With these homemade recipes, every woman will be able to independently reduce and even remove under-eye wrinkles and prolong youthfulness of skin. At the same time without spending a lot of money and without using expensive cosmetics.